Well that was a bit of a surprise early on a Wednesday morning, with Force India deciding to get out for an early installation lap and show us a side on view of their 2014 challenger. Force India find themselves with an all new driver lineup for 2014 with Nico Hulkenberg making his return to the fold, joined by Sergio Perez following his departure from McLaren. Having abandoned development fairly early on into 2013 to concentrate their efforts on the VJM07 the latter part of last season was perhaps unrepresentative of the teams performance. They also found themselves on the back foot when Pirelli were forced to return to the 2012 construction with the team having extracted performance early on that saw them ahead of McLaren. 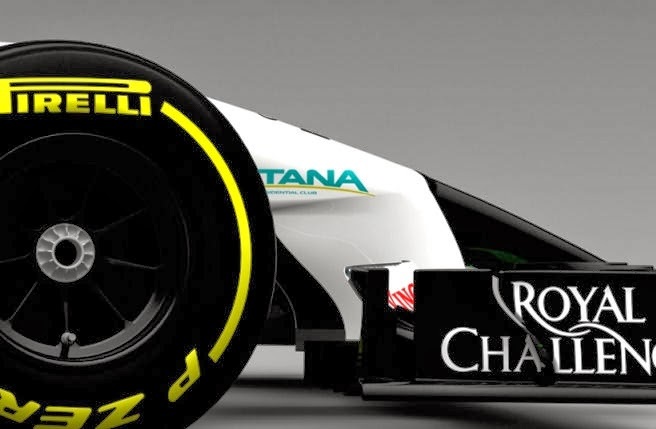 As I have discussed on numerous occasions on both the blog and social media the design demands for 2014 are significant in terms of both aerodynamics and powertrain and so it was no surprise they sacrificed 2013 for a run at 2014. In terms of design however I long held the belief that for 2014 it may be pertinent to be the tortoise rather than the hare, as chasing extremely fine margins could be the difference between getting points or not finishing. I only have the side on image to work with at present but with the first day of testing at Jerez only 6 days away you won't have to wait long for the rest of my analysis. So what can we tell from the image? Starting at the front of the car we already know that the Front Wing is 150mm (75mm either side) narrower this season and although I strongly believe that every car on the grid will feature an outwash design like we saw in the last rule set, there were some speculating on teams going with an inwash design. 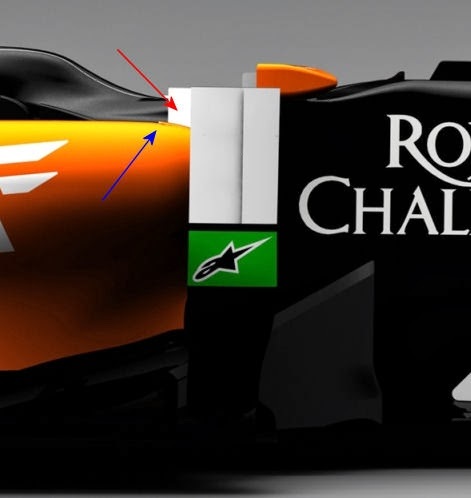 From the image it's clear that Force India have stuck with an outwash design with the Endplate split into 2 sections akin to the Mercedes W04 design whilst a gap is left at the rear allowing for airflow to be pushed outward. The nose is of course an area of the car that will garner interest as visually there is a marked difference with the FIA requiring the nose tip to be set at 185mm rather than the 550mm with previously had. 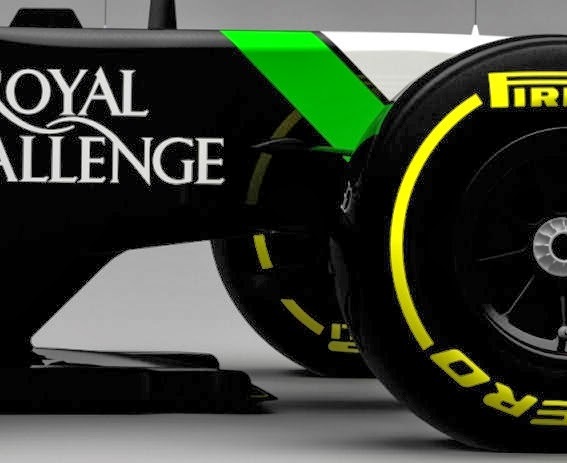 It's difficult to ascertain the full design of the nose from the side on image and moreover the design will most likely change by the time the team arrive in Melbourne. However what we can tell is that the nose in this image may be akin to the anteater style we have seen proliferate many of the 2014 sketches presented thus far. The rapid ascent of the lower section of the nose allows room for the airflow to rush into and is sped up by the shaping of the elongated pylons which seemingly taper in then out, like a venturi. 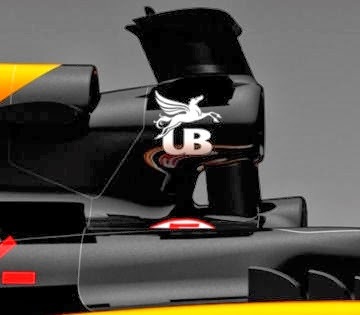 We are unable to see the Turning Vanes due to the side angle of the image but just aft of that is an area that had been talked about in advance of the cars launch. With some of my collegues speculating that the team may scallop out the underside of the chassis for airflow reasons and use a vanity panel on top the chassis to match the dimensions. From this image at least it seems the team have decided against such a design implementation but again with the front wheels in the way, this is by no means definitive especially as the top of the chassis remains flat up until the curvature of the nose. The splitter on the VJM07 looks remarkably like it's predecessor with the team opting not to utilise a metal/carbon stay. The Bargeboard and Twin Airflow Conditioners look reminiscent of the VJM06's but it's a couple of things that are within that focal point that interest me. 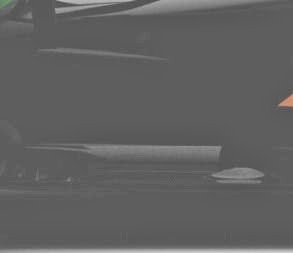 In what appears to be alongside the cockpit is a substantial white element (Red Arrow) which could be an enlarged Vortex Generator. We also see that on top of the Sidepod we find an outlet (Blue Arrow), these types of outlets aren't new and have been used by teams like McLaren and Toro Rosso in the past as a way to make the Sidepod work efficiently at a range of speeds. 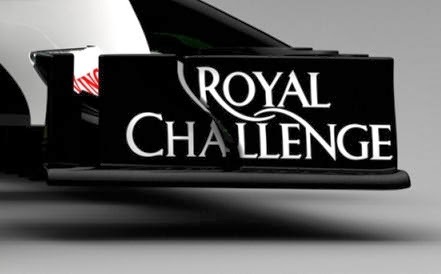 This is quite important this year as the teams look to extend the bodywork of the Sidepod once more at the rear of the car increasing the chance of boundary layer build up. The Sidepod itself features a rather aggressive undercut at the front, enabling airflow to pass undeterred around the Sidepod toward the rear of the car. The Sidepod appears to be high sided with a centralised scallop in order to keep the airflow retained within the region whilst the rear of the Sidepod allows the slower moving warm airflow from inside to escape in line with the gearbox akin to the arrangement used by Ferrari and Toro Rosso on their 2012 challengers initially. In front of the rear tyres will become a crucial area for the teams looking to minimize the amount of tyre squirt generated by the oscilating tyres and impinging on the Diffuser and even though this image doesn't show us too much a quick brightening of the area is illuminating. 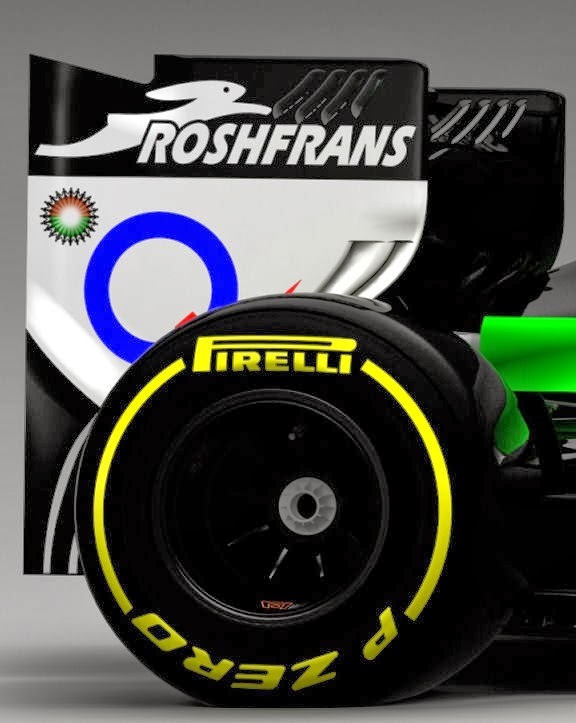 It seems the team will run with several tyre squirt slots like we say many teams utilise last season whilst a curved vertical floor strake is apparent inboard of this. Furthermore toward the rear of the strake it appears to be joined by another a little further inbound. The rollover hoop and airbox is a constant area of development each year for the teams with the area posing both safety and aero questions. It would appear that the team have decided to go for a centralised spar to hold the trapezoidal airbox inlet, which does seem markedly smaller than the VJM06's. Furthermore aft of this we find another air snorkel which is likely placed here to take care of some oil cooling for the gearbox etc. The rearward snorkel is something we have seen used by teams like Ferrari and Mercedes most recently. Although most people will be concentrated on the front of the 2014 cars it's the rear of the car that holds the most intrigue for me and although from this angle not much is given up we can see that the team have continued their development of the Rear Wing Endplates. Having been at the forefront in terms of the leading edge tyre wake slots development the team have once again stamped their authority on this area with the image showing 2 slots placed in each of the Endplates. It really goes without saying that I will of course update this article as soon as more images become available of the VJM07 in order to better analyze the merits of this years challenger as we are still unsure of the exact design implemented at the Nose, the Turning Vanes designs and most importantly how the team have handled the changes at the Rear Wing, Exhaust exit, Monkey Seat / Rear Wing Support Pylons and Diffuser. I'm pleasantly surprised to see this up so quickly! One thing to note is that the exit you talk about on the top of the side pod is a cooling exit. Either to help the top of the radiators or to cool electrical boxes its not used as a flow conditioner for the sidepod as you state. Please could you explain the use of the "tyre wake slots" ? Good article and very quick! Amazing work as usual Matt! Shedding light in a lot of little details that escape from the normal fan sight and on record time. Thanks a lot and keep it up!